For Breakfast I had a another of the Jimmy Dean Simple Scrambles Cup – Turkey sausage Crumbles, Egg Whites, Shredded Cheddar Cheese. What a change in weather! The last 2 days it’s been a high of 68 degrees and rain, today it was 12 degrees this morning and a high of 27 degrees and sunny! 41 degree difference. After Breakfast I bundled up and headed to Meijer for a few items. On the way back home stopped by the ATM, got gas, and stopped by McDonald’s and picked up Breakfast for Mom. Back home it was back to bed and rested, still lingering Sinus Infection but it’s getting better. For Dinner tonight a Seafood Special! 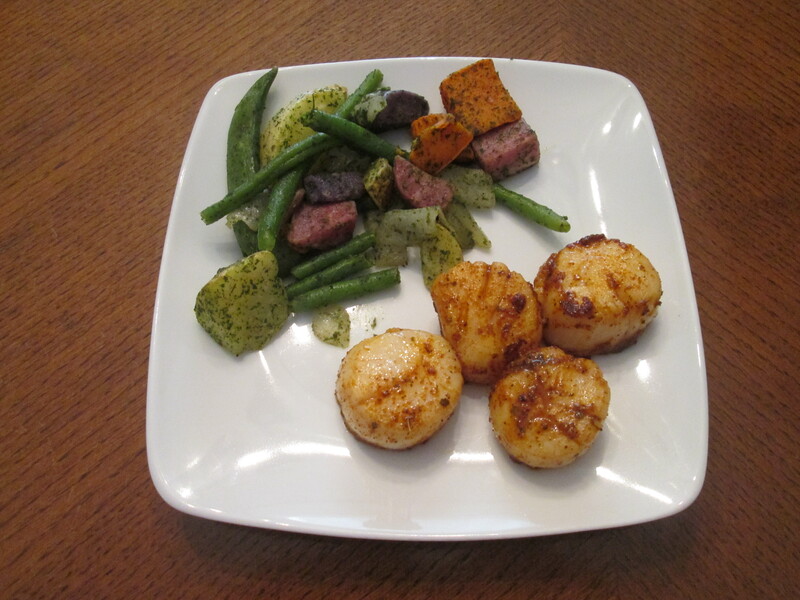 I prepared Seared Scallops and Fried Skate w/ Sliced New Potatoes and Canned Green Beans. I was planning on just having the Winter Skate Fillet but as I was getting that out of the freezer a small package of Sea Scallops fell out of the freezer so I took that as a sign that I should have the Scallops also! I purchased the Winter Skate from the Sea to Table website while the Sea Scallops are from Kroger. To make the Dish I’ll need; 1/4 cup of 2% Milk, McCormick Grinder Sea Salt and Grinder Peppercorn Medley, Progresso Italian Style Bread Crumbs for dredging, and 1 1/2 tablespoons of Extra Light Olive Oil. To prepare them I put the skate fillet in a large dish. Poured the milk over them and sprinkle with salt and pepper to taste. Make sure to turn the fillets in the milk so they are coated on both sides. Then I scattered the Bread Crumbs over a large dish. Lightly dredge the fillets in the Bread Crumbs on both sides. With fillet breaded I heated the Olive Oil a large skillet over medium-high heat. When the oil is hot but not smoking, I added one of the fillets. Saute on one side until it was golden brown, about 3 minutes. Then turn and cook on the other side until golden brown, about 3 minutes more. They came out beautiful! And I have a found a new Seafood to have! These are so good. They fried up very easy and have a very fresh taste, their taste is similar to scallops. I love this Skate! I used Kroger Seafood Sea Scallops. I took a Cast Iron Skillet and sprayed it with Pam Cooking Spray, also added 1 tablespoon of Extra Light Olive Oil and 1 table spoon of Blue Bonnet Light Stick Butter. Heated it up on medium high. Then I washed the Scallops in cold water and patted them dry with a paper towel. I’ll be using Zatarain’s Blackened Seasoning. In a small microwavable bowl I melted a tablespoon of Blue Bonnet Light Stick Butter. I then dipped the Scallops in the Butter one at a time, just buttering the tops and bottoms of the Scallop. Then I took about 2 tablespoons of the Blackened Seasoning and put it in a small bowl, and took the Scallops one at a time and pressed the top and bottom of each Scallop into the Seasoning. 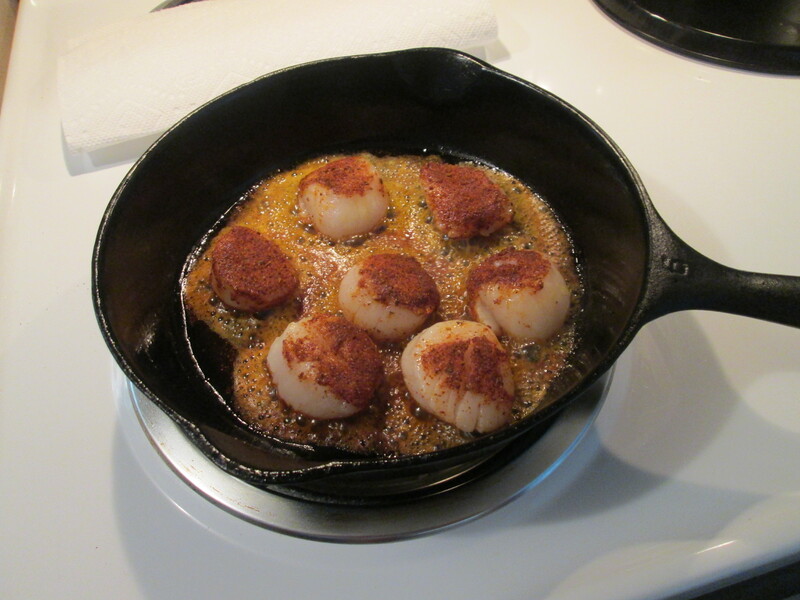 I had my skillet already heated up, added the Scallops and cooked each Scallop 3 minutes per side. As the Scallops were cooking I cut a Lemon in half and squirted a little Lemon Juice across the tops of them. They turned out delicious! The freshness of the Scallops, the butter, Lemon, and Zatarain’s Blackened Seasoning gave them an incredible flavor. I warmed up the leftover Canned Green Beans from last night’s Dinner. Love these Beans, they taste just as fresh as the day we bought them. Just heat them up in a large sauce pan and serve. Fresh Green Beans any time you want, I love it! For Dessert later A Jello Sugar Free Dark Chocolate Pudding topped with Cool Whip Free. Why We Love It: Loved by chefs and New England fishermen alike, Skate wings are sweet like scallops, delicate but firm like lobster, and often compared to flounder and sole. These skin-off fillets are hand trimmed and fan-shaped, so they make for a uniquely beautiful and delicious plate. Cooking Tip: For a classic French-inspired meal, pan sauté in a butter and caper sauce, sprinkle with parsley and serve with asparagus and roasted potatoes. Get the recipe. Where It’s From: This Winter Skate is caught off the shores of Chatham, Massachusetts — a fishing town at the elbow of Cape Cod. With an ever-growing stock level, Winter Skate is rated as a Good Alternative by Monterey Bay Aquarium’s Seafood Watch. Our Guarantee: We care about the fish you eat and work closely with our fishermen partners to provide you with the very best. If you are not 100% satisfied, we will replace or refund any item within 30 days. The flavors in this dish complement each other nicely and the chorizo adds a nice spice! The sauce can be made in advance, leaving the steaming of the mussels for the last minute. *Store mussels in the coldest spot in your refrigerator. Place on a damp paper towel in a dish and cover loosely with a damp paper towel. Do not seal in plastic as they will suffocate. Discard any mussels that when pushed shut do not stay shut, or any open or cracked mussels. 1 – In a heavy sauté pan over medium high heat, heat 1-teaspoon olive oil. Crumble sausage into pan and cook until lightly browned, about 4 minutes. Remove sausage from pan, place in bowl and cover with saran. Set aside. 2 – Return pan to heat and add additional oil if needed. Add onion and garlic, sautéing until tender, about 5 minutes. 3 – Add seasonings, tomatoes and wine. Stir to incorporate and bring to a boil. *At this point you could remove from heat, cover and reheat when ready to serve. 4 – Add prepared mussels, cover and allow mussels to steam for 4 minutes. Most all of the shells should have popped open. Discard un-open shells. 5 – Add chorizo back to pan and stir to incorporate and heat. 6 – Serve direct from pan or spoon into serving bowls. * Garnish with cilantro and lemon wedge. Serve with warm artisan bread. Our Mexican-style Chorizo makes any dish taste delicious! Wild Idea Buffalo Chorizo has a flavor that is every bit traditional Chorizo, seasoned with just the right spices, but our 100% grass-fed bison meat adds a lighter twist with powerful health benefits. For Breakfast this morning I Poached an Egg and served it on a toasted slice of Aunt Millie’s Light Whole Grain Bread. I also heated up a couple of Johnsonville Turkey Breakfast Sausage Links and had my morning cup of Bigelow Decaf Green Tea. Still some passing showers in the area, 79 degrees and humid. Well we got plenty of rain the past 3 days and we needed it! The lawns in are were turning brown so the rain was very welcome. Got the leaf blower out and cleaned the deck and driveway areas. Then after Lunch got the hedge clippers out and trimmed the vines along the driveway. Good to get out and do some work outside. For Dinner tonight its Seafood and Pasta! I prepared Baked Stuffed Clam w/ Bay Scallops Spaghetti. I was out yesterday and stopped by a Kroger and picked up a couple of Matlaw Stuffed Clams and some Bay Scallops for tonight’s Dinner. Kroger are the only one that carries the Matlaw Stuffed Clams (Brand). We have these every so often and love having them! For the Stuffed Clams I preheated the oven on 425 degrees. Lined a small baking sheet with foil and placed the Clams on it. I sprinkled some Sea Salt on them and a drizzle of Lemon Juice. When the oven was ready I baked the Clams until heated through, about 25 minutes. Meaty and seasoned just right, with a side of Louisiana Remoulade Sauce. It’s the perfect dip for all Seafood. I purchased some beautiful looking Bay Scallops from Kroger the day before. Rinsed them in cold water and stored them in a Hefty Zip Plastic Bag, kept them in the fridge until ready to use. To make the Scallops I’ll need; 2 tablespoons Blue Bonnet Light Butter, 1 1/2 tablespoons Extra Light Olive Oil, Bay Scallops (rinsed and patted dry), Parsley, Cayenne Pepper, McCormick Grinder Sea Salt and Black Peppercorn (to taste). in a large nonstick skillet coated with Pam Cooking Spray, cook scallops in 1 teaspoon Oil and 1 tablespoon of Butter, over medium heat. Seasoned immediately as you add them to the pan, Cayenne Pepper, McCormick Grinder Sea Salt and Black Peppercorn to taste. Cook the Scallops until firm and opaque; remove and keep warm. For the Thin Spaghetti I’ll be using Ronzoni Healthy Harvest Whole Grain Thin Spaghetti. To prepare the Spaghetti; cook the Pasta according to package directions. As the Spaghetti finishes drain and season. 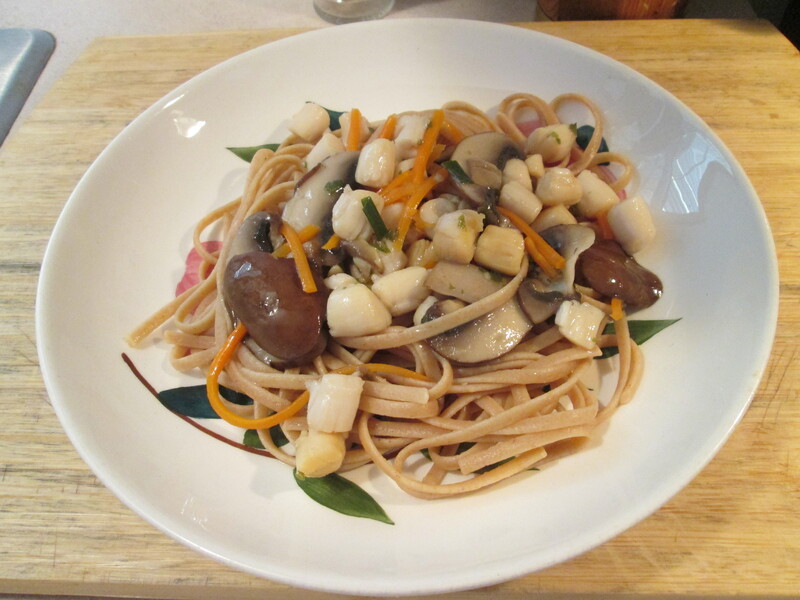 To serve make a bed of the Thin Spaghetti and top with the Bay Scallops. Topped everything with some, Dried Parsley, fresh Shaved Parmesan Cheese and a splash of the Extra Light Olive Oil. Stuffed Clams, Scallops, and Spaghetti, I love it! For Dessert/Snack later a bowl of Skinny Pop – Pop Corn and a Coke Zero to drink. Set Sail for Something Different for Dinner Tonight! a bounty of delicious options from under the sea. With families today looking for healthier and more flavorful meal options than ever before, seafood lovers young and old will enjoy discovering new items in the frozen seafood section that are convenient, affordable and tasty. That’s why, Matlaw’s, creator of America’s #1 Seafood Appetizer, has introduced a full line of products that the whole family will love. From classic New England Style, Bacon and Cheese, Chorizo or Chili Lime Stuffed Clams served in a natural clam shell; to Crispy Original, Barbecue, or Coconut Popcorn Shrimp; and Southwest Tortilla Breaded Cod, Jalapeño Breaded Cod, or Pubstyle Battered Cod, these exciting new flavor combinations are sure to have family members asking for more every night of the week. Similar to oysters and clams, scallops are filter feeding bivalves (two shells) that can be influenced by the contents of the surrounding waters. Certain plankton and the presence of scallop roe can influence the color of some scallop meats. For Breakfast this morning I toasted a Healthy Life Whole Grain English Muffin and topped it with Smucker’s Sugar Free Blackberry Jam. Also had my morning cup of Bigelow Decaf Green Tea. Chilly morning out, 27 degrees. But the day wasn’t bad, sunny and 49 degrees. After Breakfast I headed out to Meijer to do some grocery shopping, I didn’t need a lot just wanted to get out for a while. After Meijer I stopped by Kroger to pick up a few items for Mom. Then on the way home I stopped by McDonald’s to pick up Breakfast for Mom and Dad, they love that McDonald’s Breakfast. Not much else going on today so I caught up on some shows I had recorded. 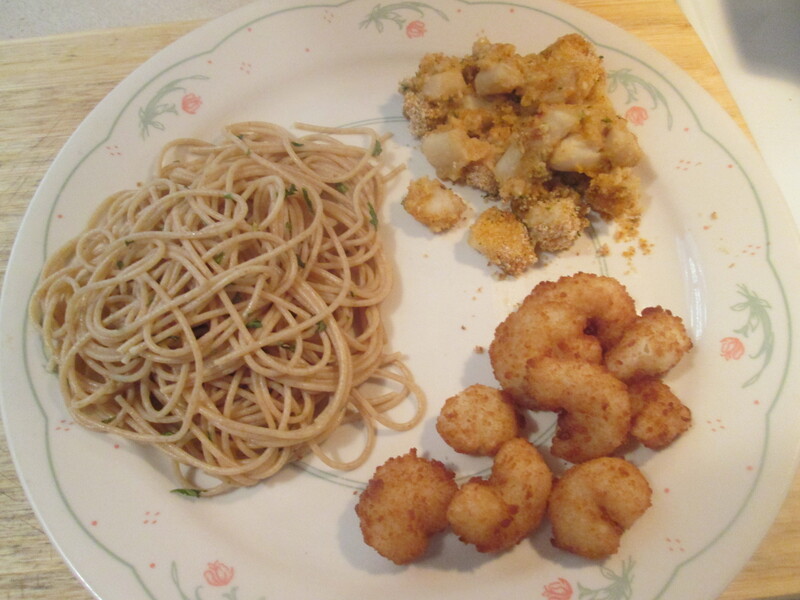 For Dinner tonight I prepared Bay Scallop and Shrimp Thin Spaghetti Pasta w/ Baked Multi Grain Bread. I wasn’t sure what to have for Dinner tonight so the last night I searched the freezer to see what I could find. I’ve been using what I can out of the freezer of late and made a huge dent in items that I had even forgot I had in there! So I got a bag of White Shrimp and a bag of Bay Scallops and laid them in the fridge to thaw overnight. I’ll be having Bay Scallop and Shrimp Thin Spaghetti Pasta w/ Baked Multi Grain Bread for Dinner tonight. I’ll be using; White Shrimp I had purchased at Kroger, Bay Scallops that I also had purchased at Kroger, Old Bay Seasoning, Lemon Juice, McCormick Grinder Sea Salt, Blue Bonnet Light Butter, Extra Light Olive Oil, Ronzoni Healthy Harvest Whole Grain Thin Spaghetti Pasta, Kraft Reduced Fat Grated Parmesan Cheese, and a Loaf of RiverRoad Bake House Multi Grain Oval Loaf Bread. I had already cleaned and rinsed both the Bay Scallops and Shrimp. Added both to a bowl and Seasoned them with the Old Bay, Lemon Juice, Sea Salt, and Olive Oil. Mixed everything up so it was all Seasoned. Next I grabbed a large skillet, sprayed it with Pam Non Sick Cooking Spray, added a Pat of the Butter, added a tablespoon of Extra Light Olive Oil, and heated on Low Medium heat. As the skillet was heating for the Seafood I took a sauce pan filled it 3/4 full of Water and lightly Salted it with the McCormick Grinder Sea Salt, heated it on High heat. Back to the Seafood. With the skillet heated I added the Bay Scallops and Shrimp. The Scallops and Shrimp will not take more than a few minutes to cook. I under cooked both just a bit because I would be adding it to the hot Angel Hair Pasta which will steam it to finish it. Put the Seafood in a bowl and set aside while my Pasta is cooking. For the Pasta I’m using Ronzoni Healthy Harvest Whole Grain Thin Spaghetti. The Ronzoni Healthy Harvest Whole Grain Pastas are my favorite to use but tough to find in the area so now I have to order it online. Easy to prepare; Boil your water with some added Salt. When boiling add the Spaghetti and, return it to a boil. Stir occasionally, cook for 8 minutes. Drain it and get ready to serve. I put it into a medium size bowl and seasoned it with a splash of the Olive Oil, a pat of Butter, a sprinkle of Sea Salt, and the grated Parmesan Cheese. Gave it a stir and added the Bay scallops and Shrimp, stirred and served! Oh what a dish! It combines two of my favorite foods Seafood and Pasta. I topped everything with a bit more of Lemon Juice and grated Parm Cheese. I could have this all the time. I had also baked a loaf of RiverRoad Bake House Multi Grain Oval Loaf Bread. This has become the family’s favorite Baked Bread. Plus I love having Bread every meal and Crusty Bread with Pasta Dishes. For dessert later a Jello Sugar Free Dark Chocolate Pudding topped with Cool Whip Free. From the Italian word for “strings”; these round thin strands of pasta are our most beloved shape. A versatile pasta shape, Whole Grain Thin Spaghetti can be used in entrées, side dishes, cold salads, or broken and used in soups. Toss Whole Grain Thin Spaghetti with almost any pasta sauce of varying thickness. Tomato or cream sauces, broth-based and meat sauces, olive oil tosses and meat sauces all work well. Thin Spaghetti pasta made with a blend of 100% whole wheat and the time-honored grains: Quinoa, Amaranth, Millet, Sorghum and Teff. No Breakfast this morning. I had to fast overnight and had to be at the Hospital at 6:45 this morning. I had to sit there for an hour and drink the solution they give you before you have Scans made, that’s the worst part. I had my yearly Scans for Melanoma done. I’ve been Cancer free since 2004 but I still get nervous taking the Scans, I guess I always will. But It’s better safe than sorry, as they say. I’ll get the results next week. I stopped by the ATM and then stopped and got gas before heading home. Mostly cloudy out today and 51 degrees with rain moving in overnight and Saturday. Did a few things around the house and then took an afternoon nap later. For Dinner tonight a Seafood Fest! I prepared Lemon Butter Dill Bay Scallops, Stuffed Clam, and Baked Potato. I purchased some beautiful looking Bay Scallops from Kroger the day before. Rinsed them in cold water and stored them in a Hefty Zip Plastic Bag, kept them in the fridge until ready to use. I’ll need some McCormick Grinder Sea Salt and Grinder Peppercorn Medley along with McCormick Fat Free Lemon Butter Dill Seafood Sauce, McCormick Grinder Sea Salt and Peppercorn Medley, and Extra Light Olive Oil. To prepare them I preheated a medium size skillet that I had sprayed with Pam Cooking Spray and added 1 tablespoon of Extra Light Olive Oil, heated it on medium heat. As the Skillet heated I seasoned the Bay Scallops with the Sea Salt and Peppercorn Medley. When the Skillet was ready I added my Scallops. Next I added a 1/4 cup of the McCormick Fat Free Lemon Butter Dill Seafood Sauce, stirred making sure all the Scallops were covered in the Sauce. Cooked them for a total of 4 minutes, stirring often. The Bay Scallops came out delicious! Scallops are so meaty and taste so fresh. The McCormick Fat Free Lemon Butter Dill Seafood Sauce was the perfect Sauce for them. You can taste the Lemon, Butter, and Dill in it and it’s Fat Free! Should go great on Tilapia, Cod, or Shrimp. As the Bay Scallops were cooking I prepared the Stuffed Clam. I purchased these at Seafood Department at Kroger. They are Matlaw Stuffed Clams (Brand) that they have in the Seafood Case. We have these every so often now,we love them! For my Stuffed Clams I preheated the oven on 425 degrees. Lined a small baking sheet with foil and placed the Clams on it. I sprinkled some Sea Salt on them and a drizzle of Lemon Juice. When the oven was ready I baked the Clams until heated through, about 25 minutes. Meaty and seasoned just right and the Louisiana Remoulade Sauce is perfect to dip it in. They go great with the Scallops. Plus they are only $1 per Clam. This and the bay Scallops make one delicious Seafood Dinner! I also prepared a Baked Potato. Seasoned that with the McCormick Grinder Sea Salt and Peppercorn Medley, and topped with I Can’t Believe It’s Not Butter. For Dessert/Snack later a bowl of Skinny Pop – Pop Corn and a Diet Peach Snapple to drink. POUR 1/4 to 1/2 cup sauce on 1 pound fish or peeled shrimp. Best with salmon, tilapia, flounder, cod, shrimp, or scallops. BAKE fish in 425º F oven 10 to 15 minutes or until fish flakes easily with a fork; bake shrimp 8 to 10 minutes or just until shrimp turn pink. BROIL or GRILL fish 8 to 12 minutes per inch of thickness or until fish flakes easily with a fork. Cook shrimp or scallops 2 to 3 minutes per side. SHAKE WELL. REFRIGERATE AFTER OPENING. USE WITHIN 3 MONTHS AFTER OPENING. For many families the Stuffed Clams have become a favorite. Each natural clamshell is filled with a delectable matlaws breadcrumb stuffing with clams, green and red peppers, and delicate spices, and individually frozen to insure freshness and flavor. They’re great on the grill and so easy to prepare. Instead of turning on the oven and heating up the kitchen, simply wrap in a foil “boat” and place right on the grill on medium heat for 25 minutes. Pair with a crunchy green salad and top with butter and lemon, (or a dash of hot sauce for the truly adventurous), is all it takes to satisfy the family. Whew, another hot and humid day out there again! Went to the bank early this morning and then to go see Dad at the rehab center, He’s doing better and getting stronger! Came home and caught up on some housework. For dinner tonight, just cooking for myself again, I prepared Cast Iron Skillet Blackened Sea Scallops w/ Four Color Potato Medley, Green Beans & Sugar Snap Peas. I used Kroger Seafood Sea Scallops, they had them on sale when I was at Kroger yesterday morning. I took a Cast Iron Skillet and sprayed it with Pam Cooking Spray, also added 1 tablespoon of Extra Virgin Olive Oil and 1 table spoon of Blue Bonnet Light Stick Butter. Heated it up on medium high. Then I washed the Scallops in cold water and patted them dry with a paper towel. I’ll be using Zatarain’s Blackened Seasoning. In a small microwavable bowl I melted a tablespoon of Blue Bonnet Light Stick Butter. I then dipped the Scallops in the Butter one at a time, just buttering the tops and bottoms of the Scallop. Then I took about 2 tablespoons of the Blackened Seasoning and put it in a small bowl, and took the Scallops one at a time and pressed the top and bottom of each Scallop into the Seasoning. I had my skillet already heated up, added the Scallops and cooked each Scallop 3 minutes per side. As the Scallops were cooking I cut a Lemon in half and squirted a little Lemon Juice across the tops of them. They turned out delicious! The freshness of the Scallops, the butter, Lemon, and Zatarain’s Blackened Seasoning gave them an incredible flavor. For a side to go with the Scallops I tried something new. While at Kroger yesterday I was looking for something different and came across a bag of Kroger Private Selection Sweet and Savory Four Color Potato Medley, Green Beans & Sugar Snap Peas. They come frozen and you can prepare them 3 different ways; Microwave them in the bag they come in, pan fry, or bake them. I baked mine, and they came out perfect! Nice variety of the Vegetables and well seasoned. I’ve found a new and delicious side dish! For dessert later a bowl of Breyer’s Vanilla Bean Low Carb Ice Cream topped with some fresh sliced Peaches. Another windy Spring Day out today. In the 60’s or 70 today with more rain on the way. Went out today and bought my Mom 5 new Knockout Rose Bushes, the harsh Winter killed all 5 she had. A pre Mother’s Day gift for her. Stopped by the store and picked up a couple of items for dinner tonight and for tomorrow. For dinner tonight it’s another new one, Scallops with Linguine and Baked Cheesy Bread. Another new recipe from the Simply Delicious/Taste of Home Magazine, Scallops with Linguine and Baked Cheesy Bread. Seafood and Pasta, always a great pairing! To prepare I’ll need Ronzoni Healthy Harvest Whole Grain Linguine, 1 tablespoon Cornstarch, 1 cup Swanson Low Sodium Chicken Broth, 2 tablespoons additional Chicken Broth, 1-1/2 teaspoons Blue Bonnet Light Butter, 1 Garlic Clove (minced), 3/4 cup sliced fresh Mushrooms, 2 Green Onions (sliced), 1/4 cup grated Carrot, 1/2 pound Bay Scallops, and 1-1/2 teaspoons minced fresh Parsley. Then to prepare it I started by cooking my linguine according to package directions; drain. Meanwhile, in a small bowl, mix cornstarch, broth until smooth. In a nonstick skillet, heat butter over medium heat. Add garlic; cook and stir 1 minute. Add mushrooms, green onions and carrot; stir-fry 2-3 minutes or until vegetables are crisp-tender. Stir cornstarch mixture and add to pan. Bring to a boil; cook and stir 1-2 minutes or until sauce is thickened. Reduce heat. Add scallops and parsley; cook until scallops are firm and opaque. Served the scallops with linguine. Wow what a delicious dish this turned out to be, another keeper recipe! The full recipe and web link are at the bottom of the post. If you like the combo of Seafood and Pasta, give this one a try. I also baked up some Cheesy Bread. 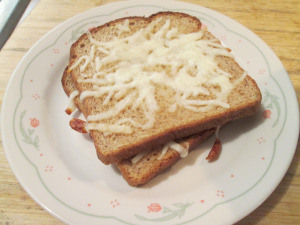 Another easy one, using Klosterman Wheat Bread, Sargento Reduced Fat Shredded Mozzarella Cheese, and I Can’t Believe It’s Not Butter. Just Butter the Bread and add your Cheese on top. Then bake on 400 degrees until the Bread is toasted and Cheese is melted. For dessert later a Jello Sugar Free Dark Chocolate Pudding. Cook linguine according to package directions; drain. Meanwhile, in a small bowl, mix cornstarch, broth and wine until smooth. In a nonstick skillet, heat butter over medium heat. Add garlic; cook and stir 1 minute. Add mushrooms, green onions and carrot; stir-fry 2-3 minutes or until vegetables are crisp-tender. Stir cornstarch mixture and add to pan. Bring to a boil; cook and stir 1-2 minutes or until sauce is thickened. Reduce heat. Add scallops and parsley; cook until scallops are firm and opaque. 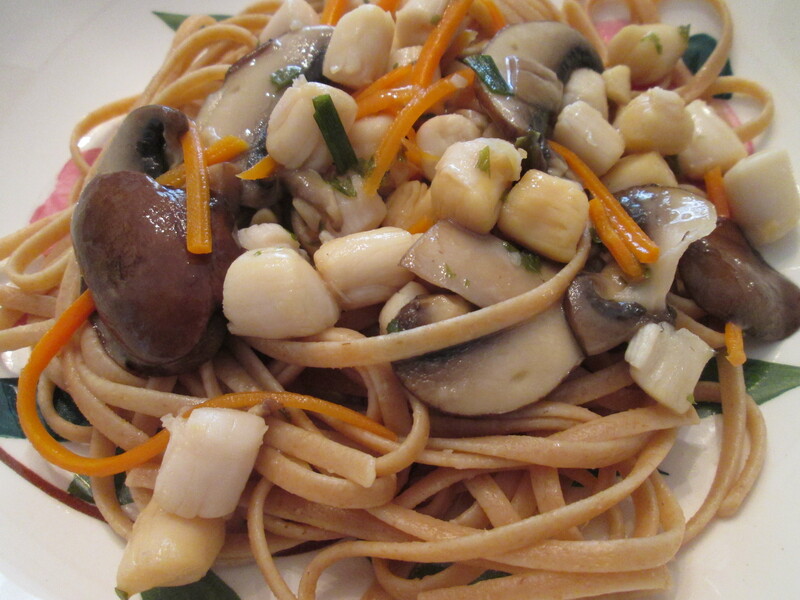 Serve scallops with linguine and, if desired, lemon wedges. Yield: 2 servings. 1/2 cup scallop mixture with 1/2 cup linguine equals 281 calories, 5 g fat (2 g saturated fat), 47 mg cholesterol, 709 mg sodium, 32 g carbohydrate, 2 g fiber, 25 g protein. Diabetic Exchanges: 3 lean meat, 2 starch, 1/2 fat. A scallop (/ˈskɒləp/ or /ˈskæləp/; from Old French escalope, meaning “shell”) is a common name applied to many species of marine bivalve mollusks in the family Pectinidae, the scallops. Scallops are a cosmopolitan family, found in all of the world’s oceans. Many scallops are highly prized as a food source; the name “scallop” is also applied to the meat of these animals when it is used as seafood. The brightly colored, fan-shaped shells of some scallops, with their radiating, fluted patterns, are valued by shell collectors, and have been used since ancient times as motifs in art and design. Most scallops are free-living, but some species can attach to a substrate by a structure called a byssus, or even be cemented to their substrate as adults (e.g. Hinnites spp.). Other scallops can extend a “foot” from between their valves. By then contracting the foot, they can burrow themselves deeper into sand. A free-living scallop can swim by rapidly opening and closing its shell. This method of locomotion is also a defensive technique, protecting it from threatening predators. So-called singing scallops can make an audible, soft popping sound as they flap their shells underwater. By far the largest wild scallop fishery is for the Atlantic sea scallop (Placopecten magellanicus) found off northeastern United States and eastern Canada. Most of the rest of the world’s production of scallops is from Japan (wild, enhanced, and aquaculture), and China (mostly cultured Atlantic bay scallops). Scallops are most commonly harvested using scallop dredges or bottom trawls. Recently, scallops harvested by divers, hand-caught on the ocean floor, have entered the marketplace. In contrast to scallops captured by a dredge across the sea floor, diver scallops tend to be less gritty. They are also more ecologically friendly, as the harvesting method does not cause damage to undersea flora or fauna. In addition, dredge-harvesting methods often result in delays of up to two weeks before the scallops arrive at market, which can cause the flesh to break down, and results in a much shorter shelf life. On the east coast of the United States, over the last 100 years, the populations of bay scallops have greatly diminished due to several factors, but probably is mostly due to reduction in sea grasses (to which bay scallop spat attach) caused by increased coastal development and concomitant nutrient runoff. Another possible factor is reduction of sharks from overfishing. A variety of sharks used to feed on rays, which are a main predator of bay scallops. With the shark population reduced — in some places almost eliminated — the rays have been free to feed on scallops to the point of greatly decreasing their numbers. By contrast, the Atlantic sea scallop (Placopecten magellanicus) is at historically high levels of abundance after recovery from overfishing. Scallops are characterized by having two types of meat in one shell: the adductor muscle, called “scallop”, which is white and meaty, and the roe, called “coral”, which is red or white and soft. 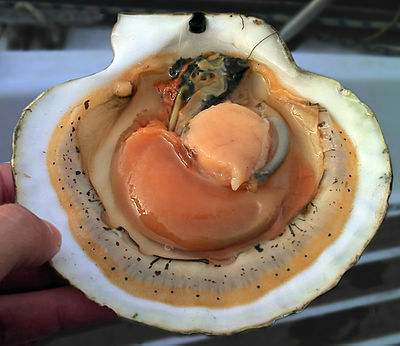 Sometimes, markets sell scallops already prepared in the shell, with only the adductor muscle intact. Outside the U.S., the scallop is often sold whole. In Galician cuisine, scallops are baked with bread crumbs, ham, and onions. In the UK and Australia, they are available both with and without the roe. The roe is also usually eaten. Scallops without any additives are called “dry packed”, while scallops that are treated with sodium tripolyphosphate (STPP) are called “wet packed”. STPP causes the scallops to absorb moisture prior to the freezing process, thereby increasing the weight. The freezing process takes about two days. In Japanese cuisine, scallops may be served in soup or prepared as sashimi or sushi. 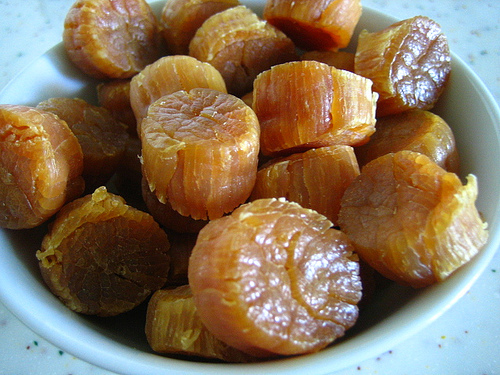 Dried scallop is known in Cantonese Chinese cuisine as conpoy. In a sushi bar, hotategai is the traditional scallop on rice, and while kaibashira may be called scallops, it is actually the adductor muscle of any kind of shellfish, e.g. mussels, oysters, or clams. Scallops have lent their name to the culinary term ‘scalloped’, which originally referred to seafood creamed and served hot in the shell. Today, it means a creamed casserole dish such as scalloped potatoes, which contains no seafood at all. It was just one of those blah days today. Nothing going on and not a thing to do, very bored. For dinner it was Seafood night! I had some Bay Scallops in the freezer that I let thaw overnight in the fridge. With them I had a small box of Pop Corn Shrimp along with some Thin Spaghetti. Tried a new recipe for the Bay Scallops, I found it on the All Recipes web site (Baked Scallops). Besides my Scallops I needed 4 tablespoons butter (melted), 1/2 cup seasoned dry bread crumbs, 1 teaspoon onion powder, 1 teaspoon garlic powder, 1/2 teaspoon paprika, 1/2 teaspoon dried parsley, 3 cloves garlic (minced), and 1/4 cup grated Parmesan cheese. To prepare it I preheated the oven to 400 degrees F. Poured the melted butter into a 2 quart oval casserole dish. Distributing the butter and scallops evenly inside the dish. I combined the bread crumbs, onion powder, garlic powder, paprika, parsley, minced garlic and Parmesan cheese. Sprinkled the mixture over the scallops. Then baked at 400 degrees for about 20 minutes, until the Scallops were firm. They came out delicious! The butter and spices provided a great taste and the bread crumbs gave it a nice crunch. A keeper recipe! To go with my Baked Scallops I also baked some Sea Pak Pop Corn Shrimp. One of my favorite boxed Shrimp. They come frozen and all you have to do is bake them for 10 minutes at 450 degrees. I only had about a half serving, to cut back the calories and carbs since they are breaded. I also prepared some Ronzoni Healthy Harvest Whole Wheat Thin Spaghetti. I also had some Del Monte Seafood Dip on the side for the Scallops and Shrimp. For dessert later a Jello Sugar Free Double Chocolate Pudding. 2. Pour melted butter into a 2 quart oval casserole dish. Distribute butter and scallops evenly inside the dish. 3. Combine the bread crumbs, onion powder, garlic powder, paprika, parsley, minced garlic and Parmesan cheese. Sprinkle this mixture over the scallops. 4. Bake in pre-heated oven until scallops are firm, about 20 minutes. They confirmed today my Dad is coming home Saturday from the rehab center! He’s been gone for a while now it’s going to be nice to have him home. So for dinner tonight while at Kroger yesterday I purchased some Bay Scallops, which I haven’t had in years! For Dinner; Cajun Spiced Seared Scallops w/ Brown Rice, Parmesan and Herb Red Potatoes, and Baked Artisan Multi Grain Loaf. To prepare it I’ll need; 1 pound of Bay Sea Scallops, 2 teaspoons Cajun Seasoning, 2 teaspoons Extra Virgin Olive Oil, 1/2 teaspoon Sea Salt, Dash freshly Ground Peppercorn, 1 tablespoon Extra Virgin Olive Oil, and 2 teaspoons unsalted Butter. To prepare them is quick and easy first in a food storage bag, toss the scallops gently with the Zatarain’s Cajun Seasoning, 2 teaspoons olive oil, salt, and pepper. Refrigerate for about 1 hour. Heat the 1 tablespoon olive oil and 2 teaspoons of butter in a large skillet over high heat. With tongs, arrange the scallops in the hot fat and cook for about 2 to 3 minutes on each side, or until nicely browned and your done! The Zatarain’s Cajun Seasoning is fantastic on the Scallops, nice heat and seasoning but not overpowering where you can’t enjoy the flavor of the Bay Scallops. For side dishes I prepared some Uncle Ben’s Natural Whole Grain Brown Rice, not much to prepare it was the microwave single serving of Rice. The quick but still delicious way for Rice. I also prepared some more of the Idahoan Parmesan and Herb Red Potatoes. Second time I’ve had these and love them! I also baked up some more of the La Brea Bakery Take and Bake Artisan Multi Grain Loaf. I’ll have to have the Bay Scallops more often! 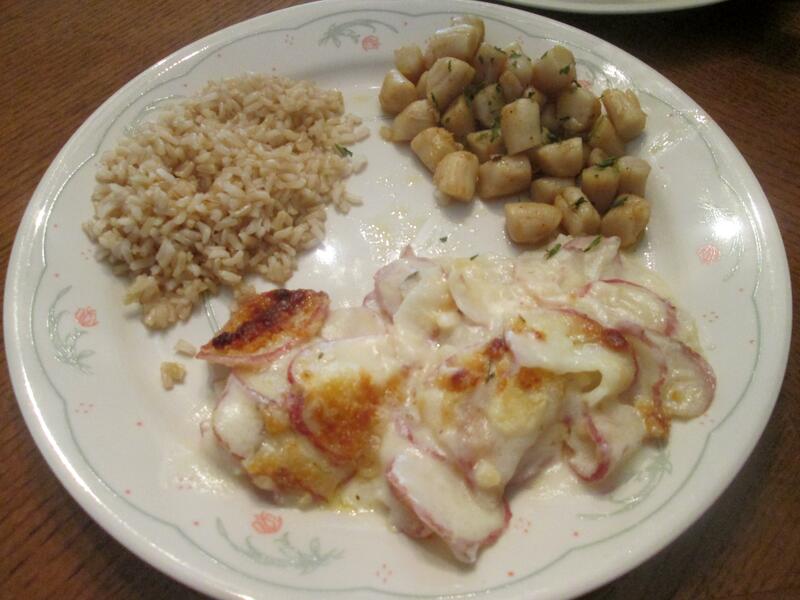 The Scallops paired with the Parm Red Potatoes and Brown Rice is perfect! For dessert later a Jello Sugar Free Double Chocolate Pudding. In a food storage bag, toss scallops gently with the Cajun seasoning, 2 teaspoons olive oil, salt, and pepper. Refrigerate for about 1 hour. Heat the 1 tablespoon olive oil and 2 teaspoons of butter in a large skillet over high heat. With tongs, arrange the scallops in the hot fat and cook for about 2 to 3 minutes on each side, or until nicely browned. Idahoan Steakhouse Parmesan & Herb Red Potatoes start with world-famous Idaho® red potato slices in a premium cheese sauce, then finish with a real Parmesan cheese topping! These Steakhouse Parmesan & Herb potatoes will add premium restaurant quality flavor to any meal. In 1 1/2 qt casserole dish, combine potatoes, contents of sauce pouch, 2 Tbsp butter, and 1 3/4 cups boiling water. Add 3/4 cup milk and stir to combine. Bake uncovered at 450°F for 20 minutes. Sprinkle Parmesan topping on top of potatoes and bake another 5 min.